Is there a bank that will exchange euro coins? If you are looking for a bank that will exchange euro coins then you could be looking for a long time! This is because both banks and bureau de change counters (such as the Post Office) will NOT change euro coins back into sterling. This is because of the huge costs in counting, sorting and shipping this low value currency – there are simply no margins in this business for the banks. So, what do you do? You have a mountain of coins to exchange somewhere and no way of doing it. It can be such a frustrating experience. But there is good news! At Cash4Coins we offer expert help when it comes to exchanging your foreign coins. Simply send us your coins, accept our valuation and you could have Sterling (or the currency of your choice) in your bank account very quickly! Take a look at our testimonials to see just what others are saying about our service. We would be delighted to give you the same experience so get in touch with us today to find out more. Although we are NOT a bank we will exchange euro coins back into cash – we provide this service for a wide variety of companies, charities, schools, museums, PTAs as well as a whole bunch of private individuals who simply want to cash in those unwanted foreign coins that they have lying around. 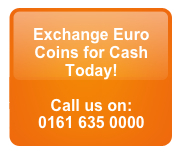 So if you are looking for a bank that will exchange euro coins then contact us here at cash for coins instead! Our service is fast, efficient and simple. This is why we are the trusted brand to exchange foreign coins in the UK. Above certain weights we’ll even collect your foreign coins for FREE – please go to ‘How to send us coins‘ for full details. You don’t even need to count your coins or even sort them as we do that job for you. Our expert coins collection team will get to work immediately. Once we have the coins we then sort and count them and provide a valuation offer to buy your euro coins and other foreign currency. If you accept the offer then payment is usually made in under an hour directly to your nominated bank account. And the great news is that if you decide not to accept our offer then we’ll send your coins back to you free of charge. So there really is nothing to lose. You can see what a great service we offer simply by taking a look at our customer comments. So if you are looking for a bank that will exchange euro coins then contact Cash4Coins instead – we’ll change your euro coins into cash in a flash! We are quick, attentive and reliable and those are just some of the reasons that our customers come back to us time and time again. Whether you are an individual with lots of leftover holiday currency or you are charity looking to boost your cashflow, we can help you to do it.